I’ve heard encouraging reports from friends who went to Oracle OpenWorld last month and are headed to Salesforce‘s Dreamforce next week. They tell me it is now becoming apparent to CRM that it needs a hand to shake on the customer side that’s not a captive one: that maybe customers need scale across the many companies they deals with, just as companies need scale across the many customers they deal with. That it’s good thing for a customer to be able to change his or her address (plus other form fields) for every company they deal with in one move, rather than one at a time within each company’s separate CRM system. That a customer should be able to intentcast as a qualified lead, safely and (at least at first) anonymously, outside of any one company’s captive marketplace. That an individual’s sovereign identity matters more to them — and to the marketplace — than any administrative identities conferred by companies or governments. That the negative externalities of unwelcome surveillance tend to outweigh whatever positive internalities the practice provides. That co-creating the customer experience is better than having one side in charge of the whole thing — especially when the customer has few ways to bring consistency to her experience with many different companies. That customers should have clouds of their own (aka personal clouds, stores, vaults, PIMS), and not just those of silo’d services. That customers need ways to express their own policies, preferences, terms and conditions, and not be forced all the time to accept those provided by sellers — and that mutually agreeable terms will be far better than the one-sided (and in many cases unenforceable) ones nobody reads because there’s no point to it. 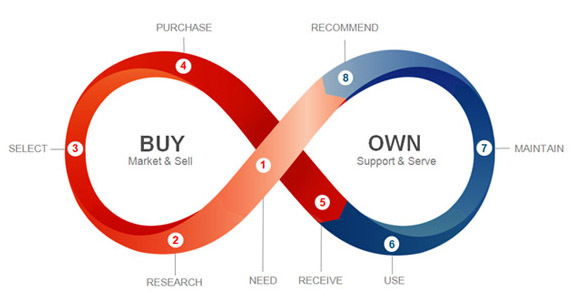 That there is far more leverage on customer retention in the “own cycle” than in the “buy cycle” of the customer experience. Speaking of which, here’s how that cycle looks, thanks to Esteban Kolsky, who drew the original: There are now many dozens of developers in or near the VRM space that can be helpful for CRM as well. 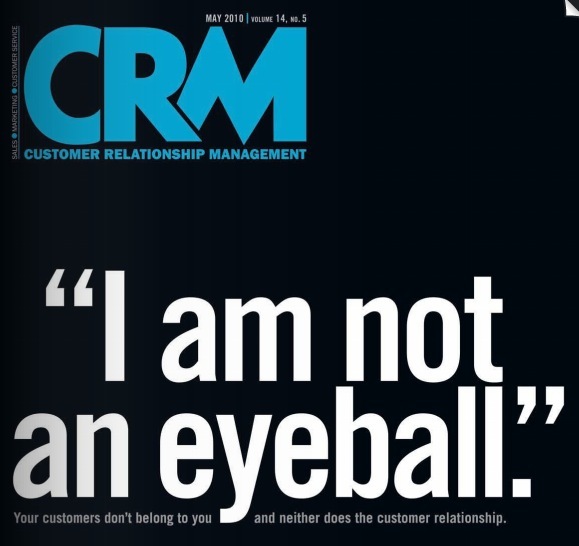 VRM developers need to know more about how to connect with and help CRM systems and related ones, such as sCRM (social CRM) Customer Experience Management and call centers. So I encourage everybody involved in CRM or VRM to come to VRM Day and IIW. It’s time to make good on the promise we’ve seen coming for way too long.